Standing dead trees, or snags, are unique features of ecosystems representing post-disturbance biological legacies. As such, the abundance, volume, size and distribution of snags can affect wildlife communities and stand-level biological diversity. While the importance of snags is widely recognized, factors influencing the use of snags by wildlife are less understood. Characteristics such as the wood properties of different tree species, local environmental conditions, and the proximate cause of tree death (insects, disease, senescence, wind, fire, etc.) can influence decomposition and subsequent use by wildlife. 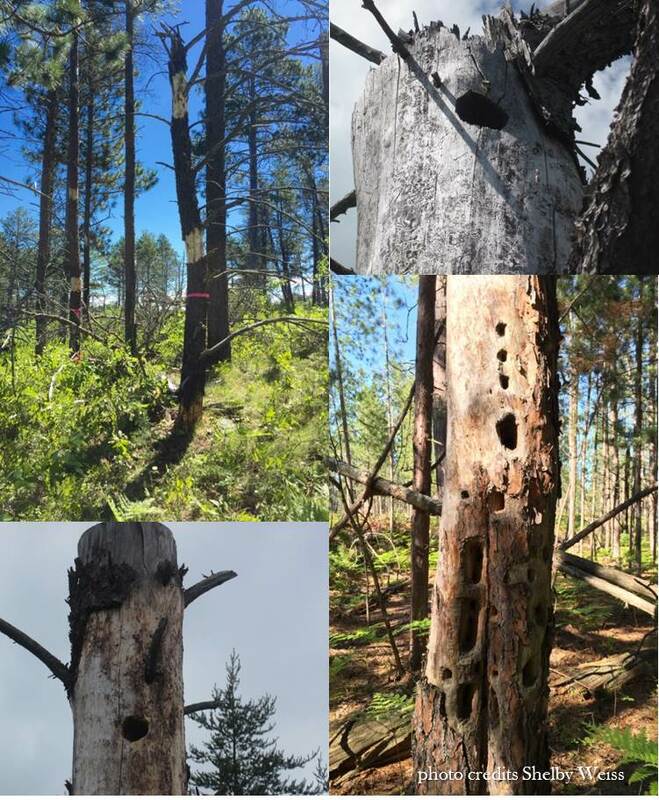 Building on previous research in eastern Upper Michigan, the objectives of this study were to characterize decay patterns in jack pine (Pinus banksiana Lamb.) snags that had been killed by girdling, prescribed fire, or topping, and determine the effects of these treatments on subsequent utilization of the snags by subcortical insects and woodpeckers (Picidae). The prescribed burn, topping, and girdling treatments were implemented in 2003, 2004, and 2007, respectively; woodpecker excavations were quantified in 2014 and insect activity was measured in 2016. Principal component analysis was used to examine the relationships between snag and decay characteristics, and past insect activity. An information theoretic approach to model selection was then used to rank potential predictors of woodpecker foraging activity and cavities. Snags created by topping had decay characteristics unique from the other two treatments and had the highest levels of past insect colonization. However, trees killed by prescribed burning had the greatest number of cavities and woodpecker foraging excavations. Girdled snags had the lowest evidence of past insect colonization. Comparison of candidate models found that treatment type was the most influential variable predicting foraging by woodpeckers, while a combination of past foraging activity and snag diameter were the most influential variables predicting presence of cavities. These findings inform options for generating snags when managing for biological legacies and wildlife habitat within jack pine forests of the Great Lakes region.